This is a public service announcement to critters everywhere: the farm is full. We love y’all dearly, but for the love of all that is country life, we simply can’t take one more right now. When we lost our dear sweet Abby girl earlier this year, we were down to 16 beloved fur-kids of all shapes and sizes. Cowboy and I were content to let the number dwindle on its own over time, but alas the animals had other plans. Yeller Feller peeking our behind the wild verbena, contemplating coming in for dinner. Enter Yeller Feller. (Yes, you can thank Cowboy for his name.) A yellow tabby tomcat with no tail. 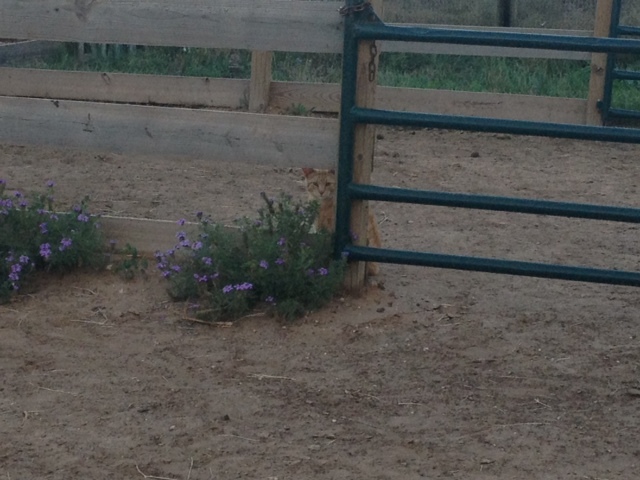 We’d seen him from time to time around the farm, but he’d dart away quickly and was clearly a wild kitty. Until, that is, Cowboy started feeding him. Yes, you heard me correctly, Cowboy was the softy this time. He started putting some extra kitty kibble out at night and low and behold Yeller Feller started getting brave and coming around. He’s not quite sure about us just yet, but Cowboy has made time to sit in the chair outside the horse stalls and get closer to Yeller, and Yeller has rewarded him by letting him get a pet in. We’ve now progressed to ear scratches, and he’s beginning to follow us around the farm during chore time. He’s still not totally sure we are not going to eat him, but day in and day out, Yeller Feller is making his life on the farm. So as soon as we can get his trust a bit more, we’ll be off to the vet for a round of shots and a neutering. Yeller Feller will live at the farm with fresh food and water and lots of pets as long as he wants to. And likely over time, in the night time hours he’ll find his way into the barn with Nightmare to avoid the boogie man hours in the evening. Which leads me to the second part of my PSA, people please spay and neuter your pets and don’t just dump them out to fend for themselves. 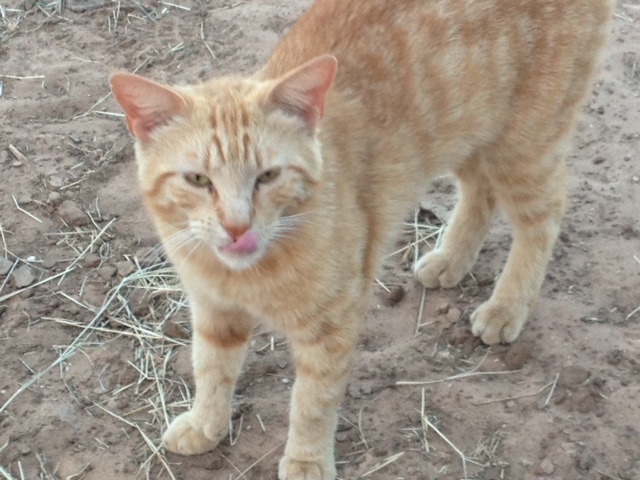 I’m not sure if Yeller Feller ever had a family or if he is the product of wild kitties himself, but he’s clearly heard the underground animal hotline that says the farm is an excellent place to call home. While we love our critters here, what breaks my heart most of all is that so many of our critters lost their families or never had them to start with, all because folks did not care enough. I truly believe that how we treat the least among us is what resides in our hearts. We owe it to our animal friends to give them the best life we can, and not to abandon them. It’s not fair to them, and it passes the responsibility down the road. Yeller Feller, you certainly found a good road. We’re glad you joined us, but please let the hotline know there is currently no room at the inn. P.S. I secretly wonder if our beloved fur-kids who have crossed the rainbow bridge lead the next one to us. Abby was yellow, and maybe she thought we were getting too many grey pets around here and needed to even the score.